Face of Australia is an Australian drugstore brand that was on sale at Big W a couple of days ago, and they are already products that I was intensely curious about, so I decided to pick up a small selection. 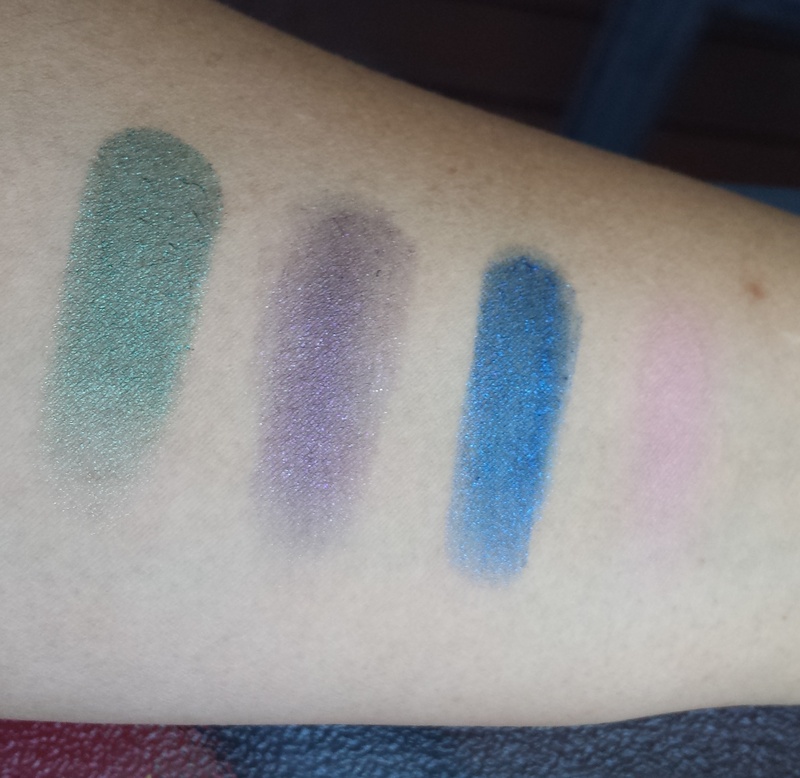 I got the Budge Proof Eyeshadows from top to bottom in Poison Ivy, Violet Days and Midnight Sky. I picked up one blush in Primrose, and 4 lasting looks lip cremes in (from left to right) Many Moons, For-red-er, Rubies and Love Berry. These were on sale for just over $5 each, and are a creme to powder long lasting eye shadow, budge proof, so they claimed. They were cheaper than the Maybelline Color Tattoos, but definitely do not perform as well. They have a sheer, powdery texture and come off quite blotchy when applying as a swatch or on the lids. The best performer was Poison Ivy, the deep green colour, which has flecks of glitter but is quite powdery when applied. They budged from my lid pretty quickly unfortunately, making their name completely inaccurate! It’s a product that you can *make* work, but it takes a bit of effort, which is a shame, because in the pots the colours are really seductive and pretty, but on application, pretty disappointing. I’m glad I only got these on sale! I only got one shade of blush in Primrose and it swatched very sheer and slightly powdery on my arm. Fortunately, when I applied it on my cheeks, it was sheer but buildable and had good colour payoff. It didn’t feel or look cakey after building up the colour a bit, and the pink is quite a cool but natural shade, and is quite pretty on the face. A nice blush, not a massive standout, but nice overall. 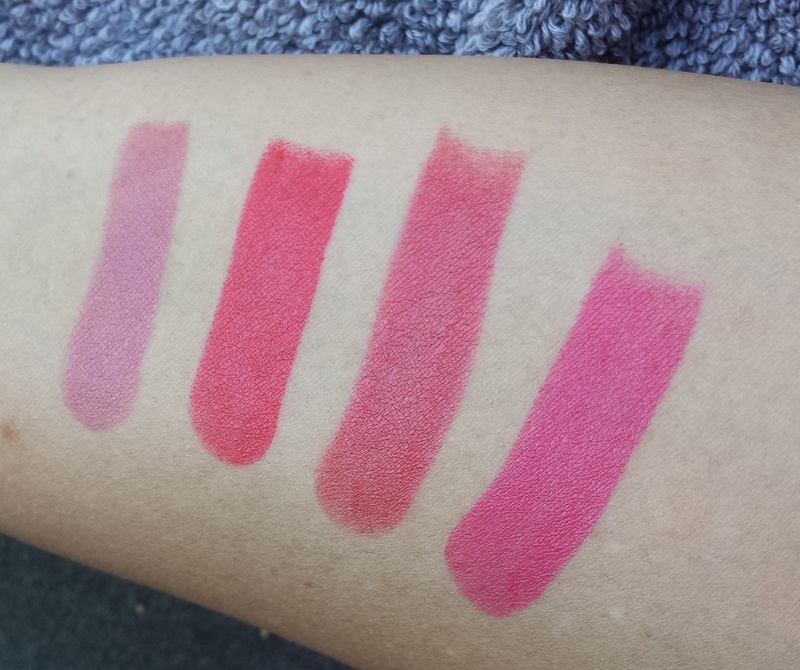 From left to right: Poison Ivy, Violet Days and Midnight Sky, plus a swatch of the blush in Primrose. From left to right: Many Moons, For-red-er, Rubies and Love Berry. Wow. These are impressive drugstore lipsticks! I had not heard or read about these lipsticks and stumbled upon them in my local K-Mart and bought one shade, close to my own lip colour, Many Moons. Many Moons is a mauve-y ‘my lips but better’ shade with a nice natural sheen. I was impressed by the sleek packaging, the creamy texture, the long wear time, the colours and the LACK OF TASTE! Yay! FINALLY a drugstore lipstick that had low scent and nearly no taste whatsoever. I absolutely *hate* the ‘lipstick’ taste of all lipsticks, I think drugstore lipsticks in particular can have a very strong plastic-based lipstick taste and I particularly find that is the case with Covergirl and Maybelline lipsticks. As much as I love the big name drugstore lipsticks, I am always put off by any sort of taste. All of the shades I picked up are creamy, opaque, long lasting and are very flattering colours. There’s no glitter in the product and they feel very moisturising and have good wear time. These are my favourite lip products, to date, and I hope they don’t discontinue them! Overall I was happy with the products, but let down by the eyeshadows. I would definitely try more lip products from this brand, or at least expand my selection of lip cremes. I think they’re divine. I’m not really sure what is happening with this brand as it’s only a small drugstore Australian brand and while I think it’s been around for a while, I’m not sure if the sale is indicative of a discontinuation or not. I don’t know how popular it is online, but I don’t see much written about it, which is a shame in the case of the lip products as they are very impressive. At the time of writing this, I was unable to access the website (it was down? or had some weird error message) and saw they could only be purchased online via Priceline Australia’s website. I have seen Face of Australia in-store at Big W, K-Mart and Priceline in Australia, if you’re curious about this brand.